Multiproduct weighter � Fresh Produce Mix Mode - G.F.T. GFT's fresh food weigher, presented at Fruitlogistica Berlin 2013 is a innovative system to weight fresh and sticky products and to weight ingredients that have to be mixed with precise percentuages. The weighter is able to automate the weighting process that before was possible only manually. The equipment reduce up to 5 time the labour cost, increasing speed , accuracy and hygene. 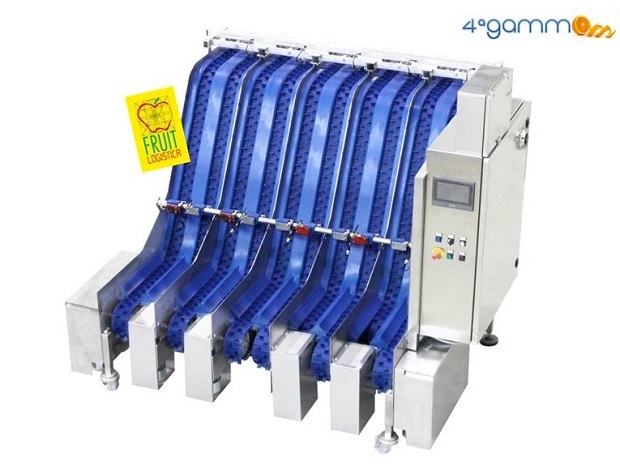 Especially designed for the fruits and vegetable, seafood, dairy and frozen food industry. MIXED MODE This machinery allow to manage different ingredients and mix them directly in the final packaging. It's particularly indicated in case of Fresh and Sticky products such as Fruit salad , Seafoods, Frozen Food. Each ingredient is loaded in a separate hopper. Each hopper feeds 2 conveyors that delicately move the ingredient toward 2 different weighing system. There are 10 weighing station in total. The special Cross Flights design of the conveyor allow to move one piece by one and have not damages for the product during transport , preserving the shelf life of the ingredients. Once the target weigh is reached the ingredients will be unloaded directly in the packaging (glass, cup, bucket, punnet). The packagings are filled with the exact product percentage for each ingredient. Capacity: up to 15 mixed ingredients beats per minute.